Christmas is just a few days away and memories of my grandmother LaValley and the cookies she baked (Cherry Winks were a favorite) and some of the crafts she did. She had sequined wreath pin that she made and she taught me. I made many and gave them to a bunch of my family and friends who still wear them. They were simple but time consuming. You cut two small donut shapes out of green felt. With one of these you sewed the sequins on by threading a sequin and a bead together. You went up through the sequin and bead and then went over and under the bead (the bead locks the sequin in). 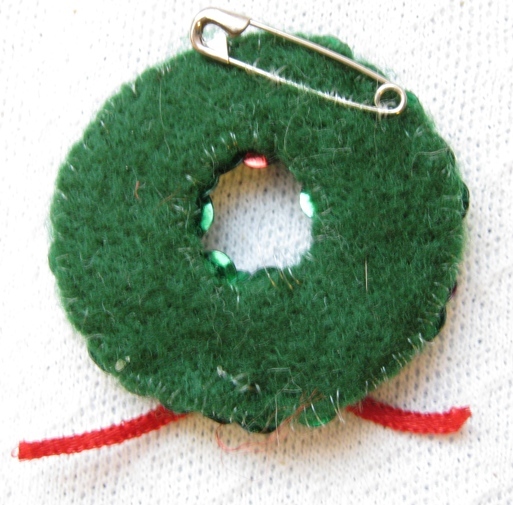 After you put all the sequins on – you sewed a small ribbon bow to the wreath – then sewed the second piece of felt to the beaded one (to hide all the stitching). The final step is to sew a safety pin to the back.